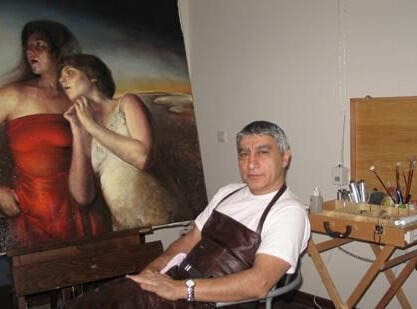 Eser says, “I do not paint to be remembered”. I think he is using his profession to develop himself and his mind. Thus I believe that art is indeed a tool. For the same reason I know Eser had and still has a problem with art-critics in newspapers. These people will not leave him in peace with his work. On the other hand I am sure that one day, he will show the world that art-critics are doing more harm than good within the art world. Once Eser applied to the Norwegian government asking to stay in prison for two years. This was so he could be left in peace to continue his work. He also wanted to change someone with a criminal background, to show those people how progress in the innersole can be made through art and how it can improve that person’s life. I know that a lot of people have tried to do such a thing with religion as a tool. With Eser there would be no religion at all, only art and self-development. “Prison should not be a penalty, but a place to give people back what is missing” – Eser says. Yet again Eser is ready to give himself to art, and to make a new start, this time without people disturbing and destroying only for profit. This way he can devote more time to develop new exiting techniques, and to plan new exhibitions for the future.